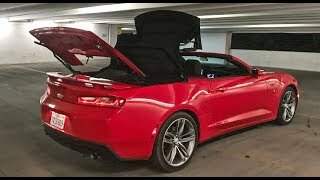 With the 2016 Coupe model, Chevrolet also unveiled its Chevrolet Camaro Convertible 2016 with some great features to rule the market and is scheduled to be showcased at the Detroit and Los Angeles Auto Show. Model is comparatively cheaper than the 4 series and has some unbeatable features in its looks that will make it irresistible. 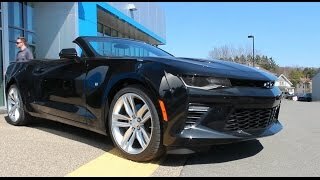 Let us have a look at the review of Chevrolet Camaro Convertible 2016 to know more. The interior of Chevrolet Camaro Convertible 2016 resembles a lot to its Coupe sibling. However there are certain features that make it unique. The first one in the list is, infinite headroom (being a convertible). Moving ahead the dashboard gets some revisions and gets adorned with an optional eight-inch configurable instrument cluster and infotainment screen at the top of center stack. Also adoring the interior is a brand new GM’s next-generation MyLink system with improved connectivity and functions. Center stack gets its buttons (most of them) below the screen and thus portray a cleaner look. Joining the same trend is the new electric unit that replaces the previous mechanical brake handle. 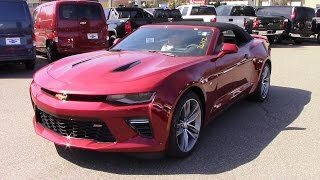 Rounding up the entire interior of Chevrolet Camaro Convertible 2016 we would say, it is a lap ahead in terms of class and looks in comparison to its predecessors. Just like the interior, exterior of Chevrolet Camaro Convertible 2016 resembles a lot to its coupe sibling. Though a few new integrations make it look bit more aggressive and classy. The front and rear together received new bumpers, body panels and some changes in the trims. The grille too came in two variants for the trims, while first is a honeycomb mesh grille, the second one has horizontal grille slats with chrome strips. At the rear end you have a trunk lid spoiler and quad-exhaust. Talking about size, the exterior of Chevrolet Camaro Convertible 2016 looks a bit smaller than its predecessors and slimmer as well. The metal roof gets replacement of soft-top while the windscreen looks a bit shorter. The new soft-top is quicker and takes less space in trunk and can be opened or closed at the speed of up to 30 mph. Beneath the hood of Chevrolet Camaro Convertible 2016 are three engine options. The first one in list is a 2.0 liter turbo generating total output of 275 hp and peak torque of 400 nm, second is a 3.6 liter V6 engine cranking total output of 335 hp and peak torque of 385 nm while the last one is throbs 455 hp and peak torque of 617 nm. As far as performance figures of Chevrolet Camaro Convertible 2016 are concerned they are not yet revealed but we expect to have them soon.